Eating sea cucumber was the most unique gastronomical experience I had in Korea. I'm not sure if it was the best, as Youngjoo's mother made us an amazing dinner after the wedding. That said, the taste and texture of sea cucumber was totally unlike anything I've ever had. The texture to me is like eating the cartilage of a pig's ear. Even after cooking a pig's ear for a long time, it still has a crunchy snap as you bite through the gristle. The sea cucumber was like that raw. The shop owner had several oxygenated tanks with sea cucumber, sea squirts, and abalone wiggling around in them. There was also a tank full of odd-looking creature that looked like a cross between an earthworm and a colon. Youngjoo said there wasn't a name for them in English, but that they lived in the mud at the bottom of the ocean. We didn't try them, and I don't feel like I missed out. To sustain us for the long day of shopping ahead, we ate one sea cucumber and one sea squirt with chile sauce. 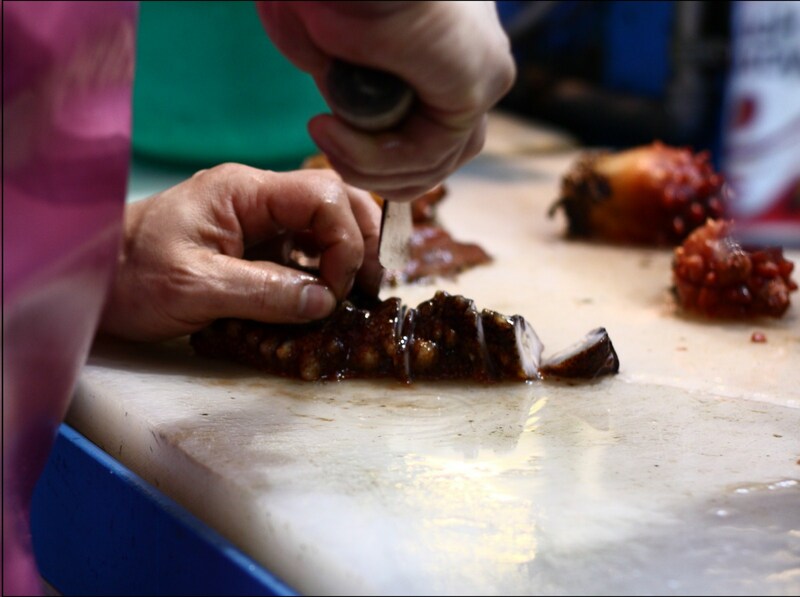 The shop owner quickly separated the edible parts of the animals from the indigestible. The creatures looked both prehistoric and alien, so I'm happy he knew which parts were good to eat. He simply sliced them into sashimi, leaving thin rings of sea cucumber next to blobby little globs of iridescent sea squirt. The taste of the sea cucumber was salty and briny, like a strong oyster. For the first second it had a slightly slimy texture, but that quickly went away as you began to crunch into it. It tasted both fresh and slightly earthy, completely befuddling my tongue. The sea squirt was much milder with a very clean finish. The squirt had a texture like a sponge, so at first it was very wet and salty. After a few chews, the flavor became delicate and tasted like...an orange? I thought my palate must have been overworked until my mother independently announced that she thought the squirt also had a citrus flavor. And this was only the beginning of our trip. Yes, the seafood in South Korea is amazing -- and amazingly fresh. I recall the last time I tried sea cucumber at the Karakdong Fish Market in Seoul. As the Culinary Pen notes, it is crunchy like cartilage or gristle, with a strong briny flavor like oysters and an earthy after taste. 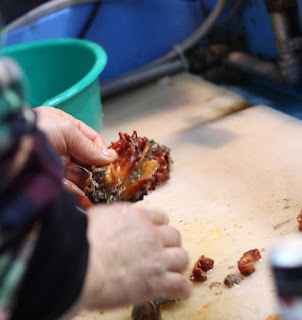 My friend, a dean at Hankuk University in Seoul, calls sea cumber "ginseng of the sea." Hey I found a bug I've never seen before. Would you like to fry it up and eat it?? Ha ha just kindding.